I planted sweet potatoes for the first time ever this year. Put them directly into the ground … which I don’t do with many of my edibles, since the Florida dirt is so sandy where I live. 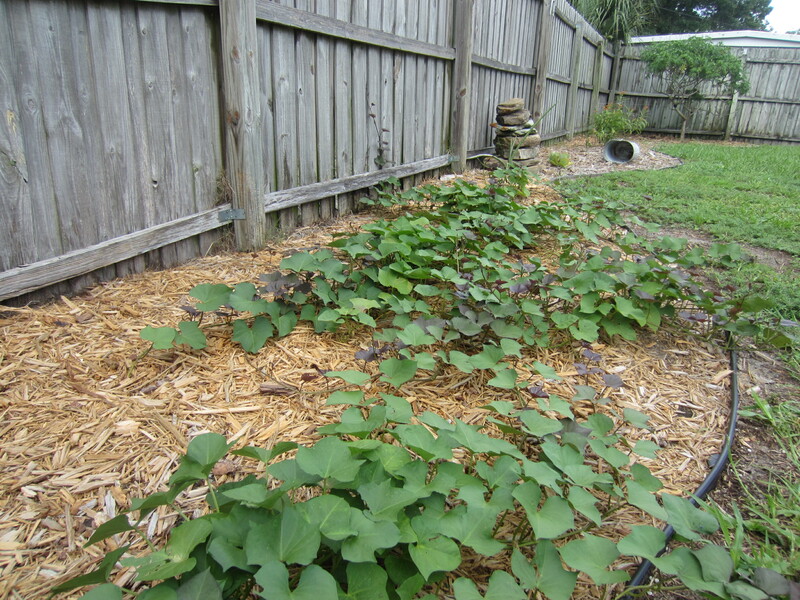 But I read that sweet potatoes thrive in poor soil and don’t need fertilizer. So I planted them (I did mix a bit of my chicken poop compost into the dirt first), mulched them, watered them lightly approximately every other day (unless it rained, which it does a lot this time of year here), and that’s it. The other day I started digging near the roots, and here’s what I got! The first two I pulled up had issues … I think it might be black rot. So I got rid of those entire plants. I’m guessing the slips I bought already had the disease. But with 6 plants remaining, I’m thinking I’ll have plenty for my small family. And here in the sub-tropics, we can grow them year-round. Here’s one of our favorite sweet potato recipes. Omit the ham for a vegetarian version. Enjoy! Sauté ham and onion in hot oil in a nonstick skillet over medium-high heat 6 to 8 minutes or until onion is tender and ham is lightly browned. Stir in sweet potatoes and sauté 5 minutes. Add garlic; sauté 1 minute. Stir in edamame, corn, broth and thyme. Reduce heat to medium. Cover and cook, stirring occasionally, 10 to 12 minutes or until potatoes are tender. Stir in salt and pepper. 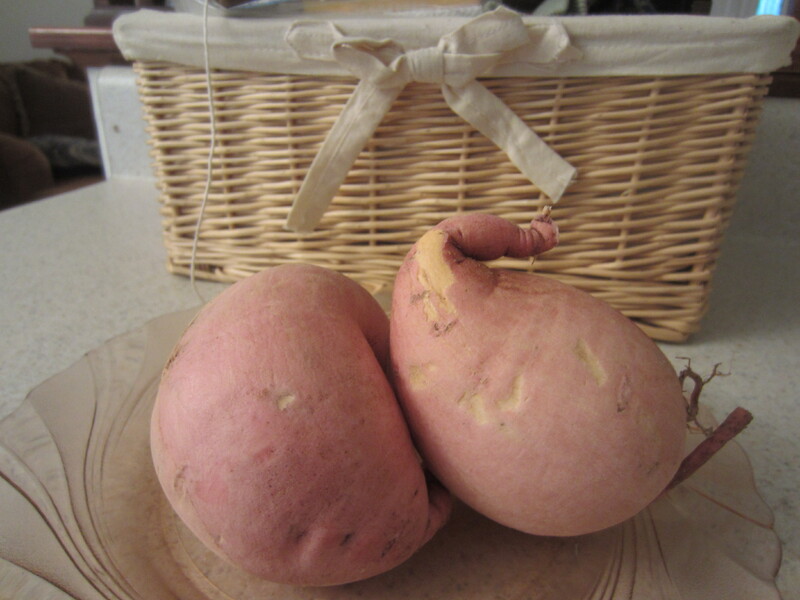 Your sweet potatoes look great. I dug around ours a little last week and they are still small. We are looking forward to eating ours as soon as possible. Since these, most of them have been small, but we’ve been enjoying those too. Did you know you need to let them “cure” before you eat them? I’ve been learning all kinds of sweet potato farming tricks!